Welcome to Gstaad, Switzerland. Photo: WikiMedia.org. According to legend, it was God's hand that created Switzerland's Saanenland region when He set it down to rest while creating the rest of the world. His imprint became the valleys and within His fingers, nine enchanting villages cradled within Alpine grandeur—chief among them is Gstaad. Located in Bernese Oberland (Highlands) in Switzerland's southwestern Alps, nearly smack dab in between Zurich and Geneva, Gstaad is renowned for its popularity among the royals, celebrities and jet set. But it's not only the rich and famous who travel to God's country, adventurers and sports enthusiasts seek challenges on the slopes in winter or summer while others in search of a rejuvenating transformation find respite in one of the Gstaad's luxurious resorts and spas. For everyone, there's shopping along Gstaad Promenade; dining at some of the world's finest restaurants where award-winning chefs serve up tantalizing flavors; sleigh rides; hot-air ballooning; music festivals—among others. Simply put, there's something for everyone in Gstaad! 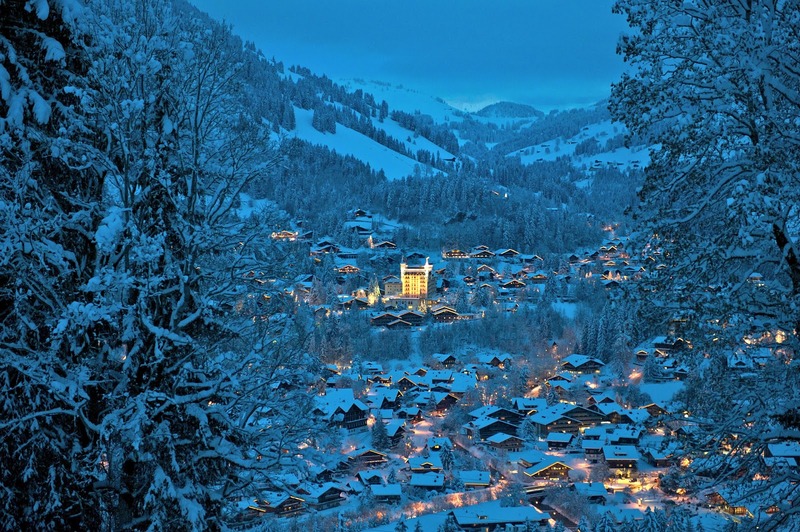 The splendor of Gstaad and the Swiss countryside at dusk. Photo: Gstaad Saanenland Tourismus. But above all that, there is something even more special about Gstaad—the preservation of its cultural heritage, it's almost palpable. Look around, you'll see, smell, hear and taste the Alpine culture as it comes to life, appealing to every sense, drawing you in. 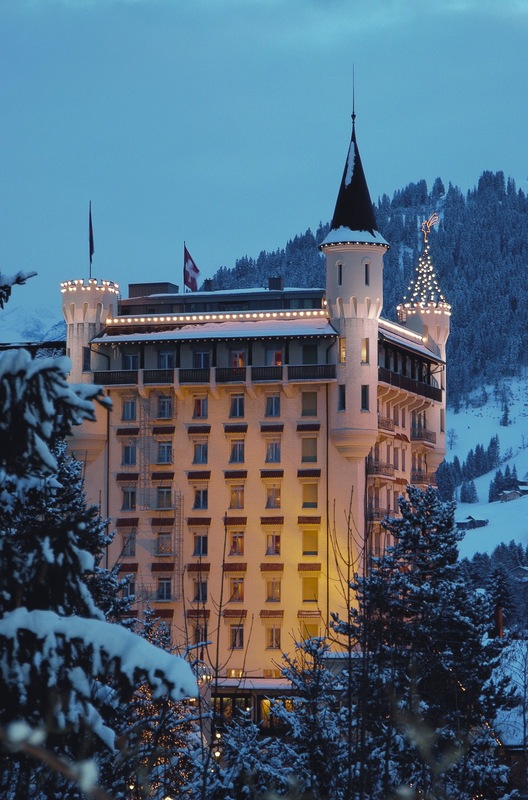 Gstaad takes great pride in its centuries-old traditions and is determined to protect its authentic way of life. 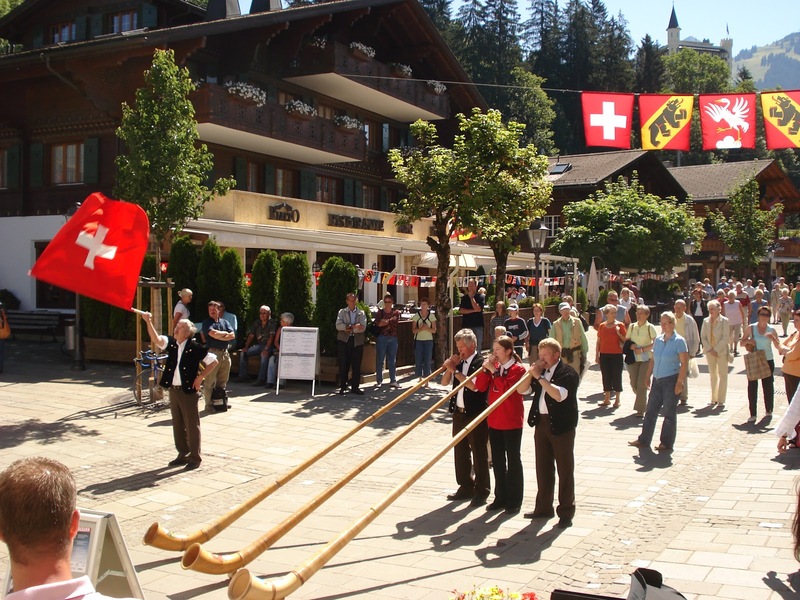 The Alpine culture is alive and well in Gstaad! Photo: Gstaad Saanenland Tourismus. First, a little introduction. Here's a short and quite hilarious video of a traveler who shares his experiences from a recent Gstaad holiday. Stroll along the incomparable Gstaad Promenade. Photo: Gstaad Saanenland Tourismus. 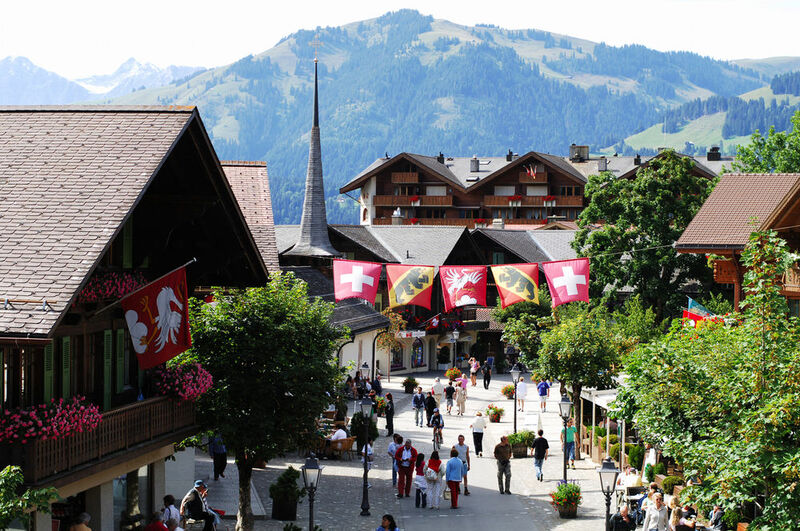 This is your hub in Saanenland—your gateway to all of the cultural and recreational activities in Gstaad and beyond! In the heart of the village, you'll find enchanting Alpine architecture lining the traffic-free Gstaad Promenade—five blocks of charming chalets comprising a mix of hotels, elegant boutiques, fashion houses, sports shops, jewelry stores, world-class restaurants and more. An afternoon or evening stroll makes for an ideal way to spend time, money and to people watch. Be sure to stop by Charly's for hot chocolate that will send your taste buds reeling! Gstaad Promenade in the wintertime is delightful especially when a steamy cup of hot chocolate is waiting for you at Charly's. Photo: Gstaad Saanenland Tourismus. Beyond Gstaad, the nearby villages of Saanen, Rougemont, Château-d'Oex, Zweisimmen, Gsteig and Lauenen are just within a few miles of each other and each offers something unique to its visitors. The Montreux-Oberland-Railways (MOB) and buses connect Gstaad with other base stations in nearby Saanenmöser, Schönried, Zweisimmen, Gsteig, Reusch, Lauenen Rougemont and Château-d'Oex. If it's cultural immersion you seek, seek no more for I have discovered customs, traditions and festivals celebrated throughout Saanenland that will immerse you into Alpine way of life. 21st Century Symphony Orchestra mit Ludwig Wicki. Photo: Gstaad Menuhin Festival & Academy. 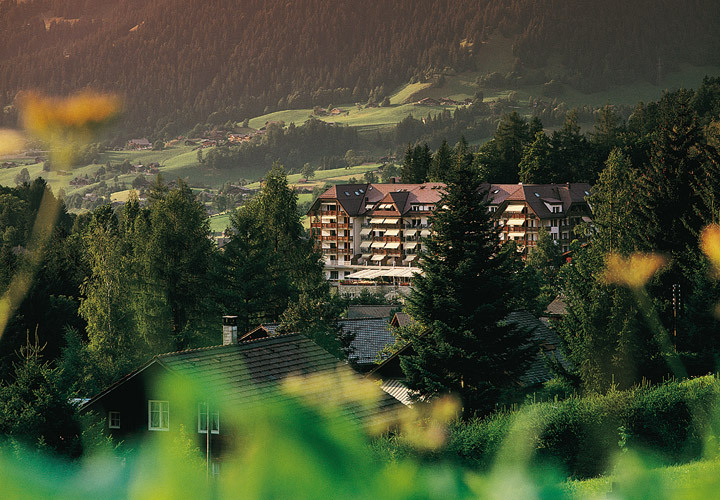 Founded in 1957 by Lord Yehudi Menuhin, one of the greatest violinists of the 20th-century, Gstaad's Menuhin Festival is comprised of 50+ musical events that take place throughout Saanenland from mid-July to early September. With a repertoire that includes Baroque, Classical, Romantic and Contemporary styles, the festival is one of Switzerland's most popular. You may even stumble upon an impromptu performance at an Alpine hut, mountain railway station and various other public spaces. 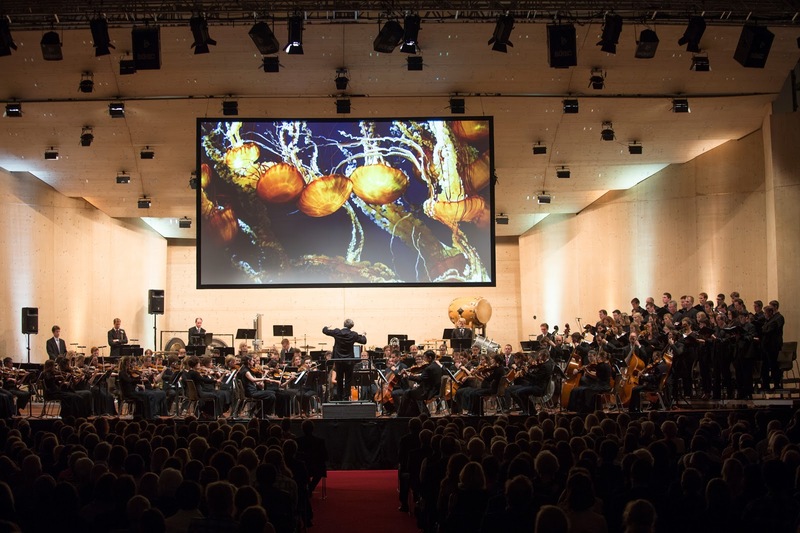 From orchestra concerts and chamber music to the opera and today's contemporary sounds, this festival is a must-see if you're planning a visit during the summer. Located in nearby Zweisimmen, the Obersimmentaler Heritage Museum is actually housed in a farm house that dates back to 1647. History buffs and antique collectors will revel at all of the furnishings and farming utensils that offer us a glimpse back in time to 17th-century life on the farm. 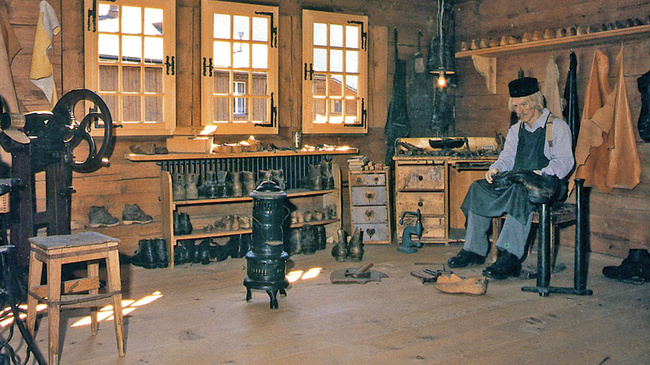 The Museum der Landschaft Saanen re-creates life over the last three centuries. Photo: MySwitzerland.com. In the neighboring village of Saanen, the Museum der Landschaft Saanen recreates the evolution of life in this region over the last three centuries—from its humble beginnings to the industries that define this area today: farming, cheese production, hoteliers and entrepreneurs. It offers great insights into the Saanenland people—a must-see exhibit for all of you cultural enthusiasts! Züglete—a must-see for families especially with children. Photo: Gstaad Saanenland Tourismus. 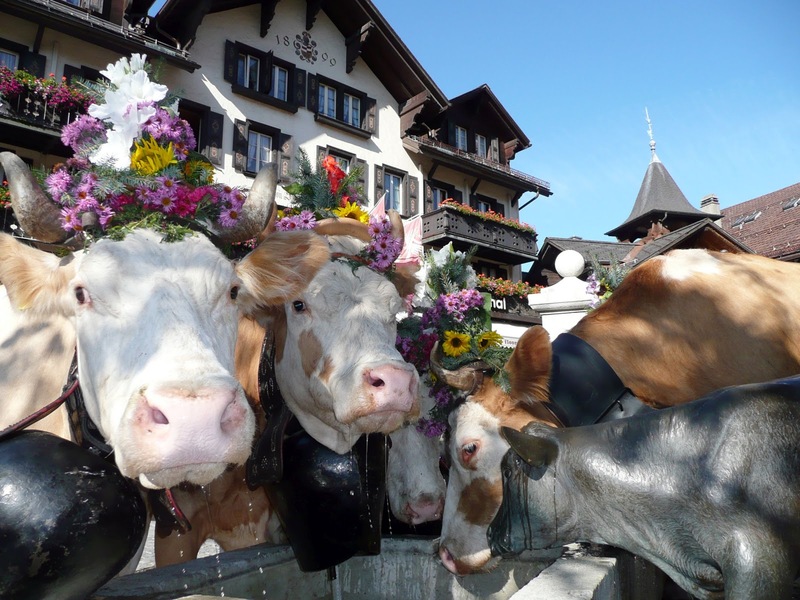 With more than 200 dairies in Saanenland, 80 of which are working farms that maintain Alpine pastures for grazing cows, you'll find farming traditions are alive and well in this region; and are celebrated in summer festivals that epitomize Alpine culture. It's an unforgettable immersion so indulge your senses and embrace new traditions. Suufsunntig or Drinking Sunday in Gstaad, Switzerland. Photo: Gstaad Saanenland Tourismus. Suufsunntig or Drinking Sunday—not the alcoholic libations you would expect, not at first anyway. We start the day in the morning with a cheesy toast made of a type of yogurt. Follow that with a glass of wine and lunch and enjoy the live Alpine entertainment: yodeling, sounds of Alpenhorn, and the piece de resistance—the crowning of the decorated prize cow. The lucky owner buys wine for everyone. Music and dance continue into the night. 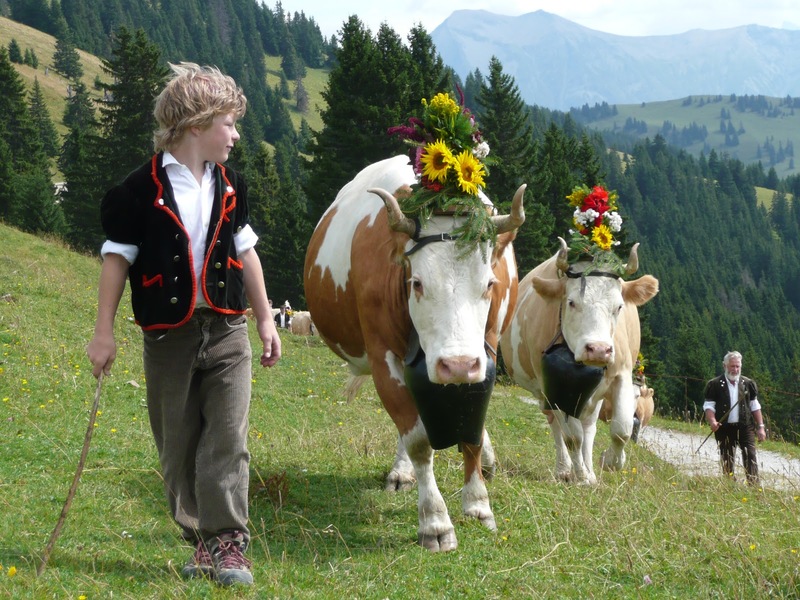 Züglete or Alpine Transhumance —a must-see for families especially with children. During Züglete, and depending upon weather conditions, farmers drive their cattle from valley floors up the Alpine slopes and then back down again, all the while the melodic pealing of the cowbells fills the air in true Alpine form. 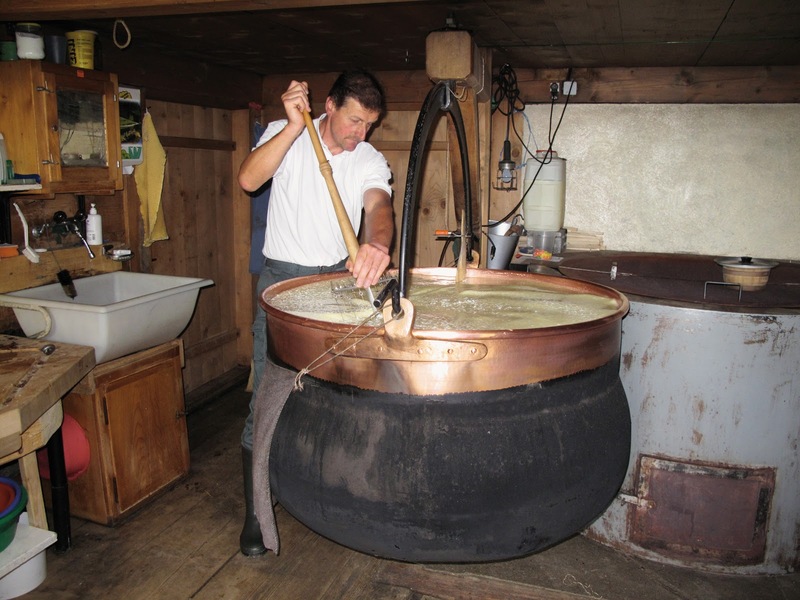 Cheese making in Gstaad. Photo: Gstaad Saanenland Tourismus. Cheese and more cheese please. Gstaad and the surrounding Saanenland region is renowned for its cheese production so it's no surprise that this rich and creamy favorite is served up everywhere. However, cheese production must conform to strict regulations established by the Appellation d'origine contrôlée (AOC), a designated place of origin as determined by the Swiss government (think wine). The regulations control where and how the cows are fed during the time period leading up to production. Farmers must stop feeding their cows silage (fodder) two weeks before production begins, and the cows must eat only what grows on their Alpine pastures. Of course supplements are forbidden. Hobelkäse is traditionally cut into fine slices before being served. Photo: Gstaad Saanenland Tourismus. 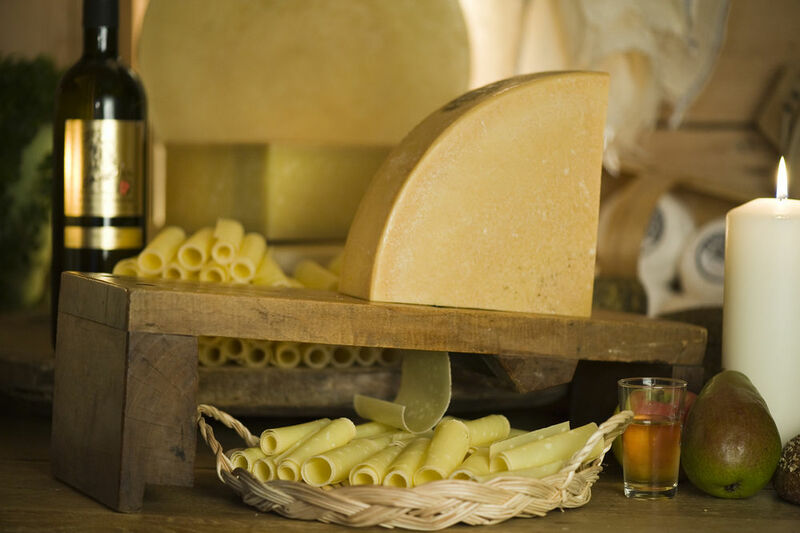 Alpkäse or Alpine Cheese is a full-fat, hard and unpasteurized cheese produced in the round. When it's further refined, it becomes an even harder cheese known as Hobelkäse. Bergkäse or mountain cheese comes from the valley and must be made only in the valley. Scrumptious air-dried beef from Saanenland. Photo: MySwitzerland.com. Farmers breed spotted Simmental cattle to produce one of the region's favorites—air-dried meat—the result of raw meat stored in a mixture of salt, herbs and spices and then hung out to dry with the laundry. Believe it or not, the larger cuts of meat can take more than a year to dry out completely. 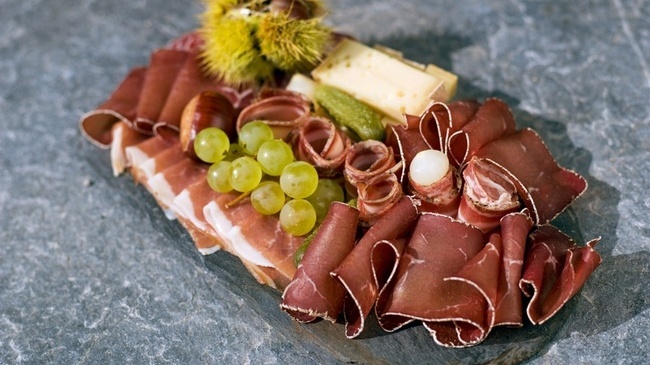 Usually served on small dishes accompanied by ham and sausages, Saanen mustard is one the Saanenland's specialties and is traditionally made from mustard seed combined with grape must (fresh-pressed juice) but in Saanenland, the producers use cherry must instead. According to the locals, every family has their own, secretly-guarded recipe. Regardless of the time of the year, Gstaad offers plenty of recreational activities for all walks of life from adventures on the slopes to peaceful retreats at the spa. Pristine Alpine slopes beckon to skiers and snowboarders alike. Photo: Gstaad Saanenland Tourismus. 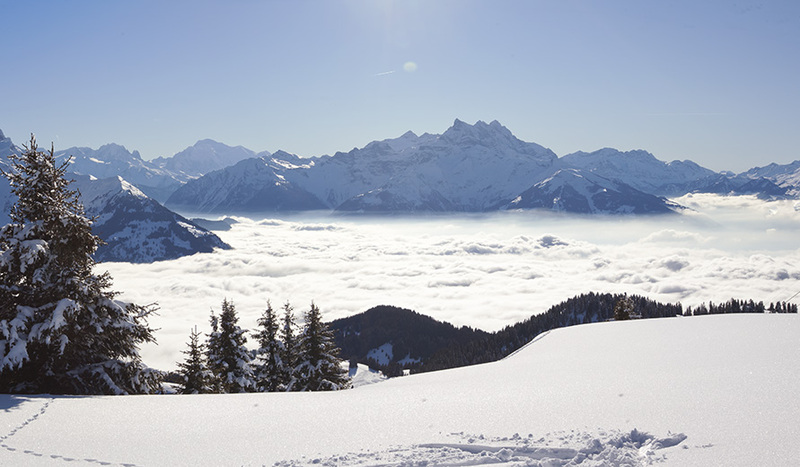 The wintertime transforms Gstaad into one of the world's premier ski destinations, not to mention one of Switzerland's largest and most diverse winter-sports regions in the country. With more than 140 miles (225 km) of slopes and trails of varying levels of expertise, the entire region is conveniently linked by the Gstaad Mountain Rides—57 transport facilities accessible from several of the neighboring villages. Winter begins here at the end of October and continues through the beginning of May. Seek out the steepest slope in Bernese Oberland, Tiger Run on Mount Wasserngrat, highly recommended. Saanen: From Eggli down to Grund. View of Gstaad from high atop the Eggli. Photo: Gstaad Palace. 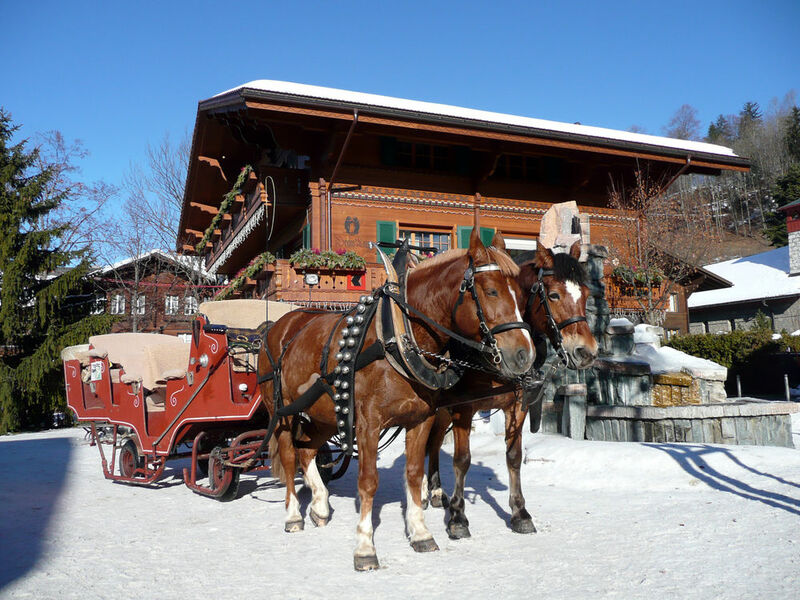 Dashing through the snow-covered Swiss countryside in your very own horse-drawn sleigh. Photo: Gstaad Saanenland Tourismus. There's simply no other way to enjoy the beautiful Swiss countryside than from your very own horse-drawn carriage. You and your family are whisked through a Swiss winter wonderland. Truly recommended for romantics. The best? By moonlight—through the natural reserve of Lauener Rohr to the restaurant Mattestübli for a fondue stop and then back along Lauenen Lake. Mush!! These huskes are born and bred to run! 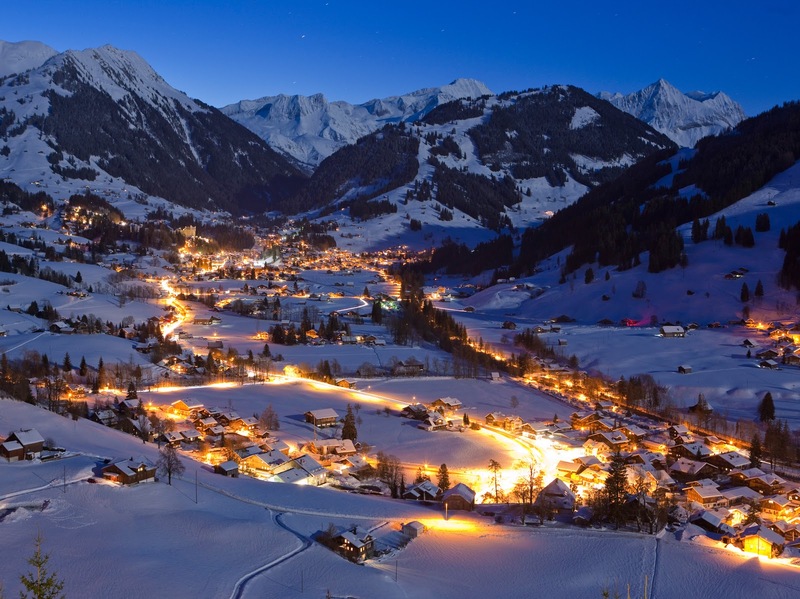 Photo: Gstaad Saanenland Tourismus. Greenland dogs and Siberian Huskies are born and bred for their brisk runs through tranquil snow-covered trails. Not only will they enjoy their rigorous trek, you will too. Exhilarating and unforgettable. Imagine floating high above pristine Alpine landscapes in a hot air balloon. Photo: Gstaad Saanenland Tourismus. Imagine floating high above silver-white landscapes and Alpine peaks laden with snow—drifting above some of the most spectacular vistas in the world—here the sky is truly the limit. 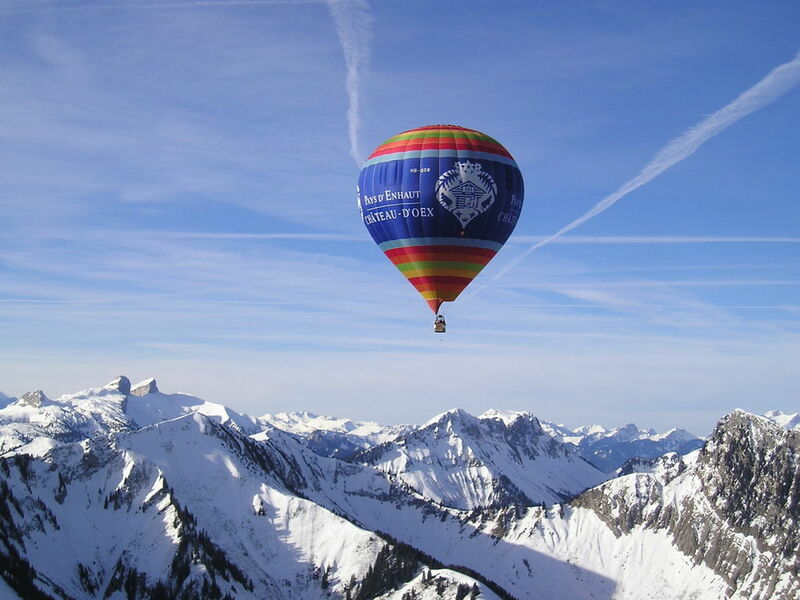 If you're planning your visit to Gstaad at the end of January, be sure to head to the International Balloon Festival in nearby Châteux-d'Oex, only 20 minutes by train. With more than 90 balloons participating in this annual event, the sky is ablaze in dazzling color. Skiing above the clouds in Switzerland. Photo: Club Med Villars-sur-Ollon. Hop onboard a helicopter for the ultimate skiing adventure or for a leisurely tour around scenic Alpine landscapes. Take a break and indulge in cheesy fondue. Photo: Gstaad Saanenland Tourismus. 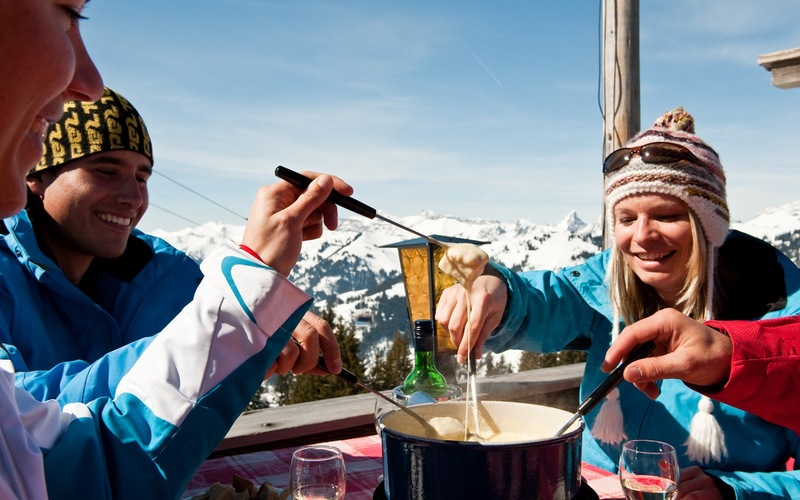 I can't think of a better reward after a day on the slopes than to sit down and indulge in cheesy fondue! After a cable-car ride on the Rellerie, there's a 40-minute hike to Mt. Hirschel. Along the way, follow the "fondue" marker to one of the three huts and enjoy. 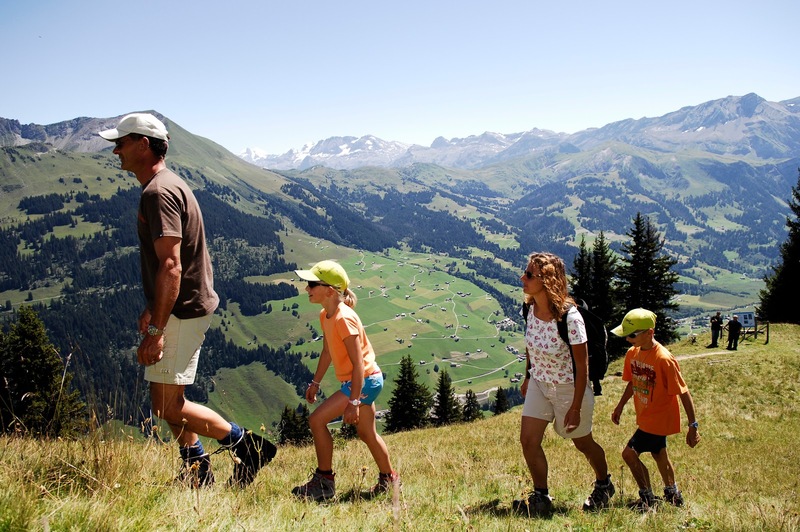 Summer hiking in Gstaad can be as leisurely or as challenging as you like. Photo: Gstaad Saanenland Tourismus. With more than 185 miles of hiking trails at your disposal in the entire Saanenland Region, there's a trail or path suitable for all skill levels from a leisurely stroll along mountain passes to rugged ascents of lofty Alpine peaks! Hikers will revel in the summertime Alpine splendor—all accessible by Gstaad Mountain Rides. Gstaad Golf. Photo: Gstaad Saanenland Tourismus. 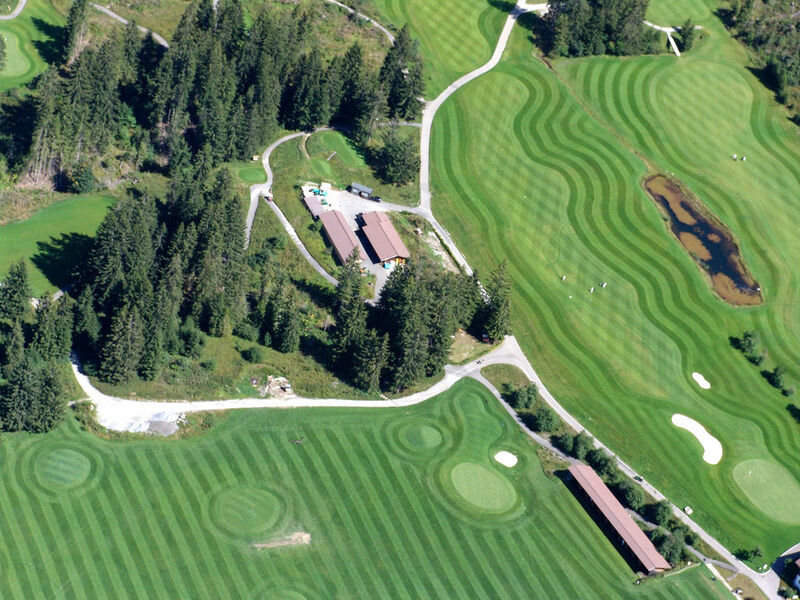 One of the world's most beautiful courses, the Gstaad-Saanenland Golf Course opened in 1961 amid the beauty of the Bernese Oberland. 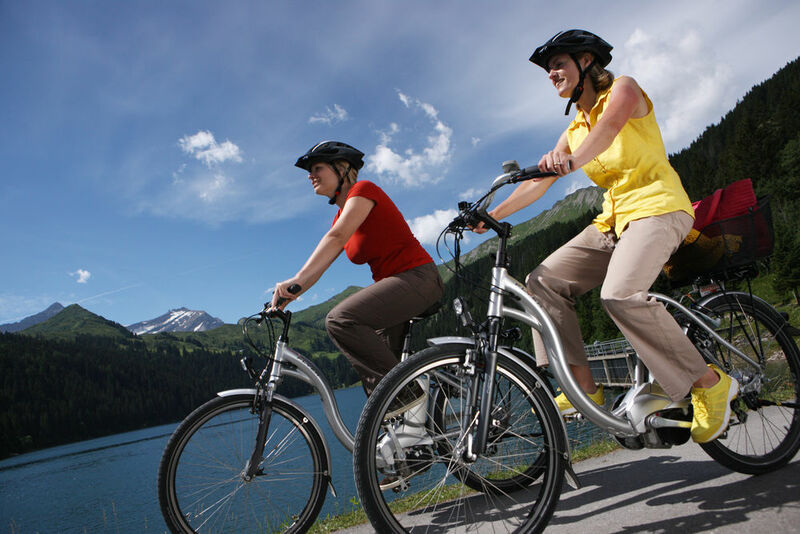 You will find more than 90 miles of bike trails throughout Saanenland. Photo: Gstaad Saanenland Tourismus. With more than 90 miles of bike routes throughout Saanenland, this relatively new form of recreation is one of the best ways to ride along through Swiss country. With varying levels of motorized assistance, you're in control. Use as much or as little as you need. Enjoy the sublime Swiss countryside from the Golden Pass Panoramic Train. Photo: Gstaad Saanenland Tourismus. Summer or Winter: Hop onboard the scenic train Golden Pass Panoramic from Montreux or from Zweisimmen, Spiez or Interlaken. Sit back and watch as the scenic countryside rolls by. Cameras at the ready! 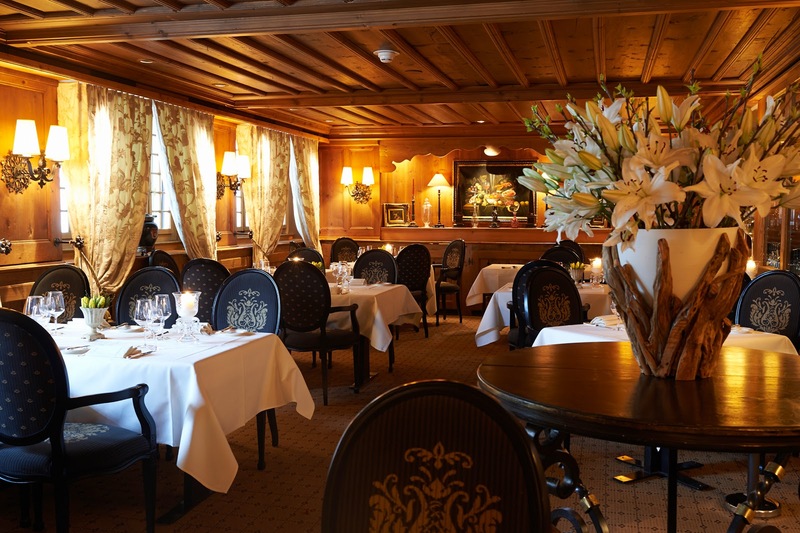 Luxurious and sumptuous doesn't begin to describe the "deluxeness" of Gstaad hotels. Needless to say, their services come at a cost but when you're staying in some of the finest hotels in the world, a little more cash is required and while the prices may seem suited for the rich and famous, there are others nearby with more affordable rates. 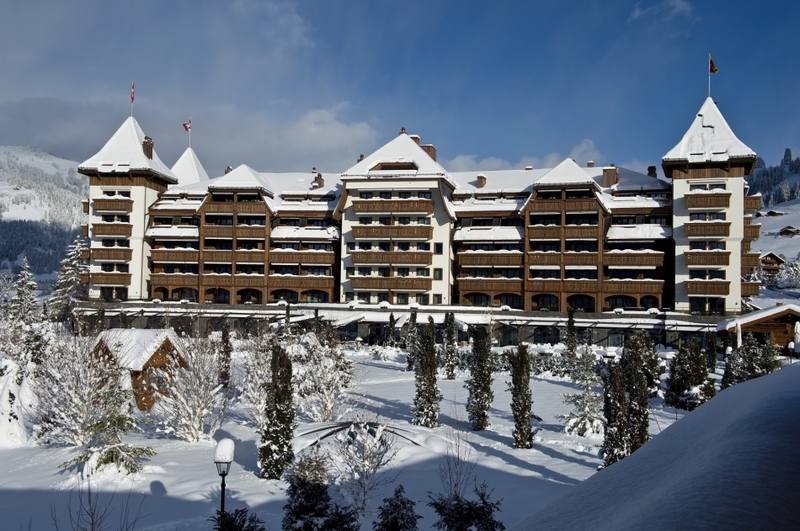 Welcome to Gstaad's Flagship Hotel and Spa - The Gstaad Palace. Photo: Gstaad Palace. 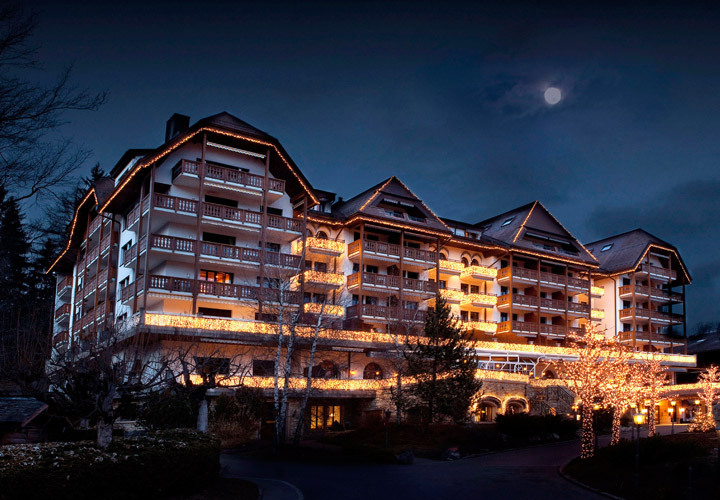 By far, Gstaad Palace is THE flagship hotel and spa and has become an icon for the Saanenland region. Built in 1913, the Gstaad Palace is perched up a hill overlooking the village and offers stunning views of the Swiss Alps. Catering to your every need, the hotel prides itself on the exceptional and superior guest service it provides to even its most discerning travelers. Among the 104 lavishly-appointed guestrooms, there are 19 Junior Suits and the luxurious 3-bedroom Pentouse Suite. Rounding out the rest the resort are its five restaurants, two bars, indoor / outdoor pool, spa and tennis courts. Lots of activities nearby include golf, heli-skiing, hot-air ballooning and more! Deluxe Suite Living Room. Photo: Gstaad Palace. 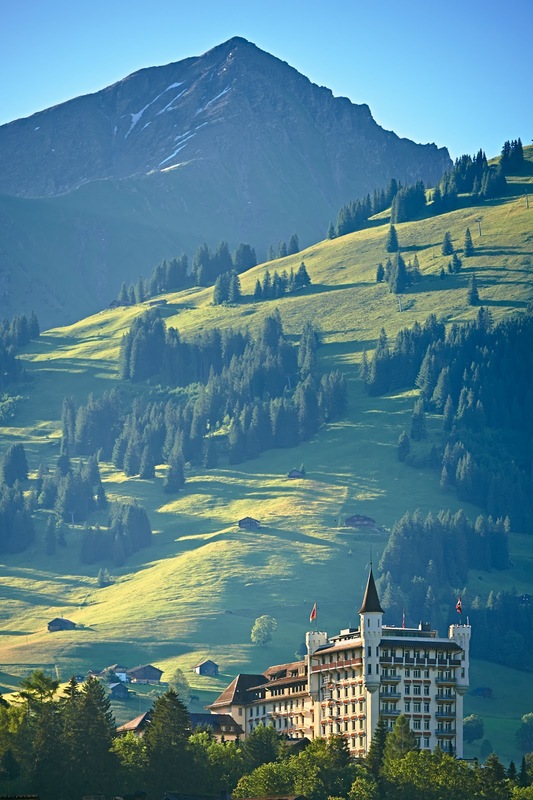 The Gstaad Palace in the summertime. Photo: Gstaad Palace. Le Grill at the Gstaad Palace. Photo: Gstaad Palace. 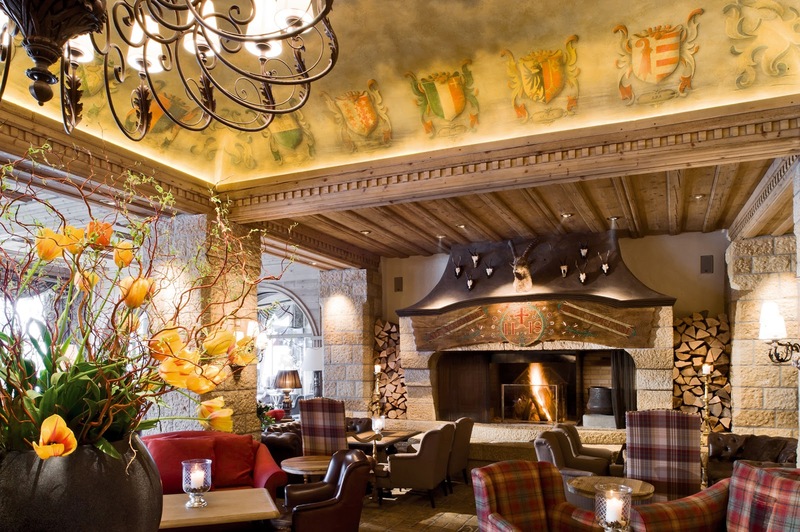 Lobby Bar at the Gstaad Palace Hotel. Photo: Gstaad Palace. The sumptuous Grand Hotel Park in Gstaad. Photo: Grand Hotel Park. The Grand Hotel Park—the classic Swiss chalet architectural style pervades throughout this luxurious Alpine retreat steps away from the Gstaad Promenade. Inside, the resort underwent a complete renovation in time for its 100th birthday. Cozy-Alpine describes the décor with elegantly appointed rooms decorated in wood, stone and replete with Bang & Olufsen equipment including free Wi-Fi. You'll find four restaurants, The Grand Hotel Park Spa with salt-water pool, saunas, Turkish bath, private cabins and more. Grand Hotel Park recently celebrated its 100th birthday! Photo: Grand Hotel Park. Gstaad's newest 5-star luxury property—Alpina Gstaad. Photo: Alpina Gstaad. 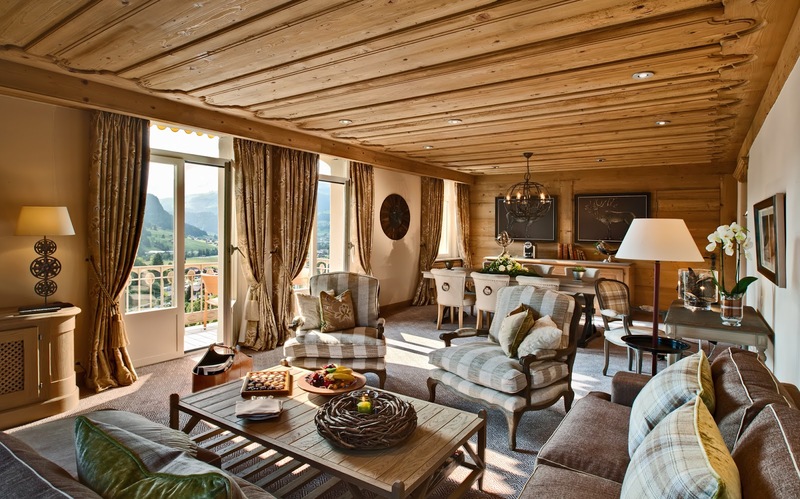 Alpina Gstaad—Alpine Chic perfectly describes Gstaad's newest 5-star luxury property that integrates stone, leather and wood into the elaborate designs throughout—from grand gathering places to the intimate settings of your rustic suite! Two restaurants, lounge, wine cellar, cigar room and the rejuvenating Six Senses Spa round out this ultimate experience in Alpine luxury. For a full list of hotels to suit all budgets, check out Gstaad.ch for a complete list of Gstaad accommodations. Saanen Airport: Regional airport in Saanen, only 2 miles from the center of the village. Nearest major airport is in Bern, 1.5 hours away. Perfect for all of you with private jets. If you want to see spectacular footage of some of the villages described above in Saneenland and then to the north, here is a wonderful fly-over video that will leave you breathless. "Ripples of Inspiration: A Travel Guide to Geneva". "A visit to Zermatt Village"
Wonderful photos!!!! A great destination for those seeking snow. Love it! Hi Marlys!! Thank you so much for your kind compliments! And you said it, Gstaad is definitely a place for snow and summer hiking too!! I couldn't agree with you more Mary! 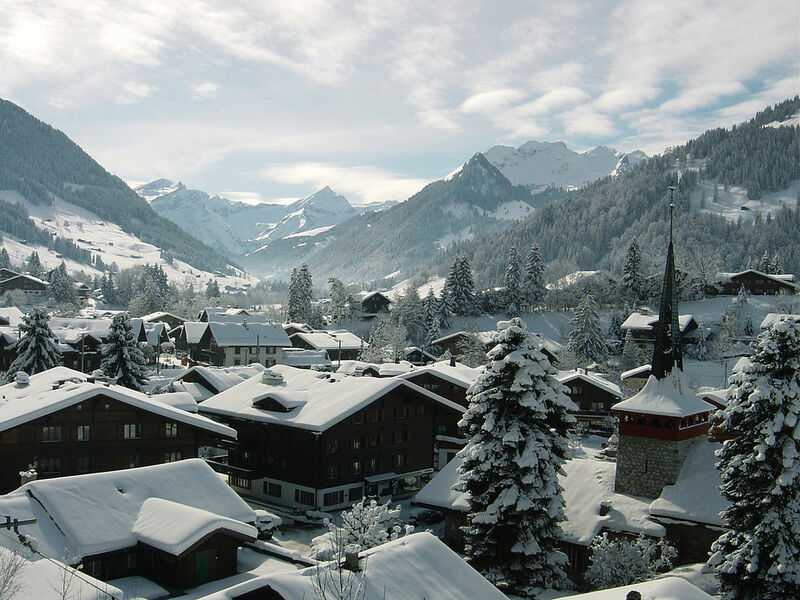 Gstaad is truly a magical place in both winter and summer too! Thank you for you kind words and for stopping by to share your thoughts! Thank you for writing back to Mary my friends at Gstaad Palace. Your comments are very much appreciated! Super interesting post! What a variety! An Alpine town full of surprises! I love it! Hi Agata and thank you so much for stopping by!! I loved putting this piece together and could have written another 2,000 words about how wonderful this little slice of heaven is in Switzerland! Wow what a great article; I loved it. Have to go and make my travel arrangements right away. Hello there my Anonymous friend! Thanks so much for stopping by and for your kind words! Save your pennies, you're going to need them but it's all worth it! 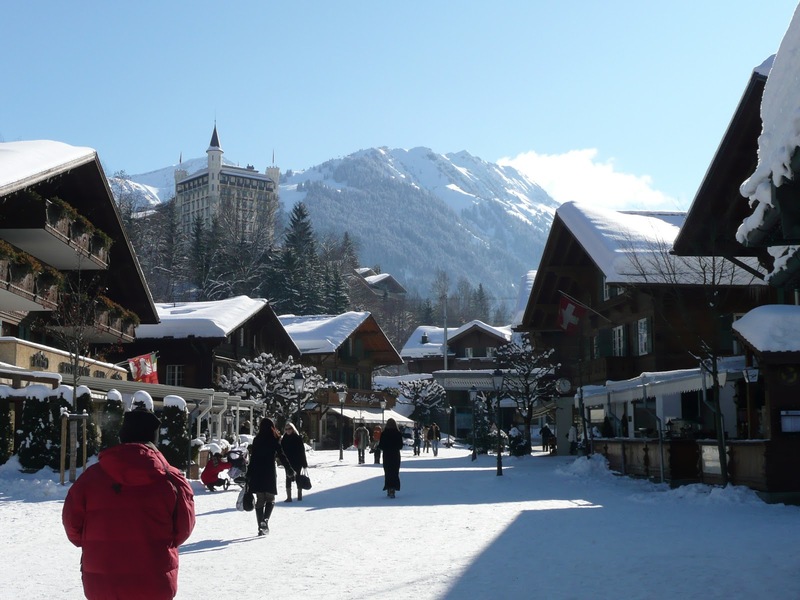 Gstaad is so pretty; I spent my birthday there once, loved it in autumn. Had no idea there was so much to do, though. Think I'll take the kids next time. How wonderful!! It's absolutely some of the beautiful countryside in the world!! And yes, you should bring the kids too!! Thanks so much for stopping by and sharing your experiences!! I have never been to Gstaad but I so want to go after reading this. It looks like an amazing place. I would love to go dodge sledding there. The accommodation all looks wonderful as well and the views WoW. I couldn't agree with you more Freya! It's quite spectacular! 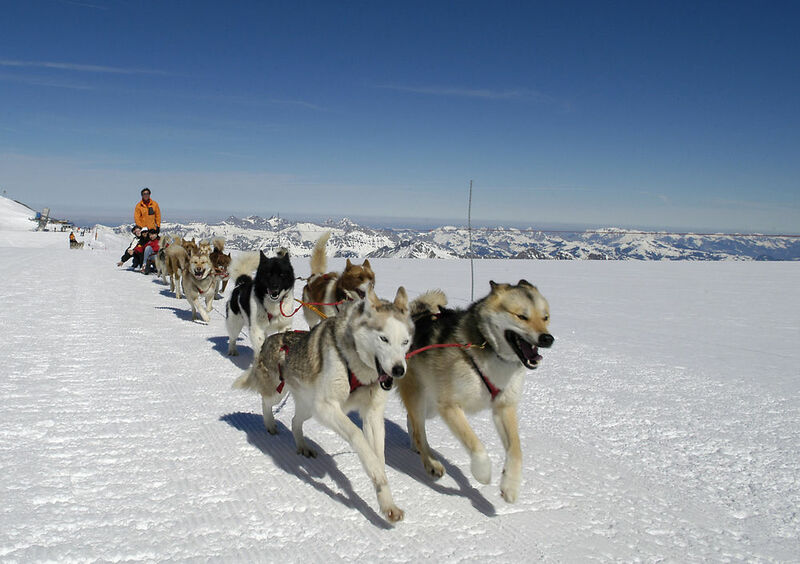 Dog sledding is high on my list as well!! Thanks so much for stopping by and sharing your thoughts!! The scenery is so picturesque. Would love to enjoy a hot chocolate from Charley's on the promenade. Luv the drinking cows! I will you join you Lyn for sure! Yes, those cows are so cute especially the baby at the right. Thanks again for stopping by and I'll see you at Charly's! I wish I went there while I was in Switzerland, but I had limited time. I hope I can go back. I am with you Fabiana!! I am hoping to see it next year after my Viking River Cruise ends in Basel! It's only a two hour ride away from there!! Gstaad looks exquisite, Jeff. I can't decide which season would be most beautiful in which to visit. Winter has that heavenly snow but summer has the cows bedecked with flowers. I think I'd opt first for summer hiking and flower-decked cows:)) Absolutely gorgeous post. Hi there Lesley! I too am torn but I would be more inclined to start with the snow-laden landscapes and riding along in a one-horse-open sleigh. ;) This way, we can compare and contrast and then share our adventures from both summer and winter in a new book. Wouldn't that be wonderful??!! Thanks so much for stopping by and for your kind words!! This was by far one of my favorites posts to write and I had lots of great support too! I love your articles; you always label your photos. I have seen so many sites where there is no info on who the picture is attributable to. I would not be happy if one of my photos was used without my permission: Bravo! Thank you so very much for stopping by and for your kind words. As you know, attribution is very important especially when the photos are not mine and used with permission of those mentioned, whom I am grateful to for helping me bring my articles to life! Thank you! !